Staff photo by Erin O. Smith / Paul Neumaier, a Tropical Smoothie Cafe franchisee, likes the location of his new restaurant in the Waterside development in East Brainerd. 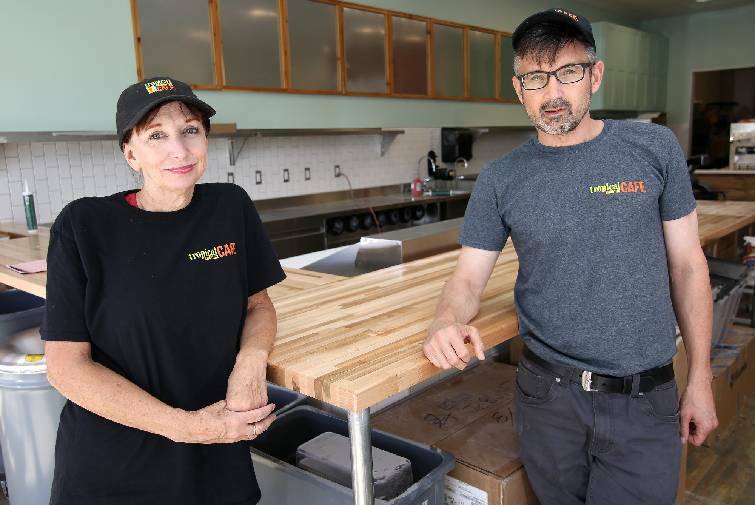 Bev Noa, the manager of Tropical Smoothie Cafe, and Paul Neumaier, the Tropical Smoothie Cafe franchisee, ready the restaurant for its opening. New restaurants are flowing into the Waterside retail center in East Brainerd — at least four are to open by the first part of 2019 — and the owner of one of them cites a pair of key anchor stores. "People love Publix. Same thing with REI Co-op," said Paul Neumaier, co-owner of the Tropical Smoothie Cafe slated to open Thursday at 2380 Lifestyle Way. Waterside, after a slow time gaining traction earlier this decade off Shallowford Road near Interstate 75, is about 90 percent leased up, according to developer Branch Properties of Atlanta. Neumaier said he likes Waterside's proximity to nearby Shallowford and the busy Hamilton Place area with its concentration of professionals and others who may like to try something different for lunch such as his eatery. In addition to smoothies, the cafe will serve wraps, flatbread, pressed sandwiches and breakfast items, Neumaier said. He said patrons of the franchised chain in other locations like its range of healthier products. "Eat better. Feel better," the business owner said. "The food is really good — the whole atmosphere." He expects the new restaurant, a $300,000 investment, to hire about 24 people. -Newk's Eatery, a sandwich shop, has an opening set for later this year. -Drake's, which includes traditional American-style pub food, is to debut early next year. -A Korean barbecue restaurant not yet named is slated for the center with an opening prior to Drake's. Brett Horowitz of Branch Properties, which developed Waterside with DeFoor Brothers, said Newk's is a fast-growing, quick-service chain offering sandwiches, soups, pizza, etc. Drake's will provide "a great neighborhood hangout," he said, while the barbecue restaurant will have a dining experience Horowitz thinks Chattanoogans will embrace. The biggest new prospective tenant in Waterside will be Haverty's, the furniture retailer which already has started construction in the former HH Gregg building. Neumaier, who owns the Tropical Smoothie restaurant with sister Karen Wallis, has another eatery in Chattanooga, though it's cross town off Hixson Pike. He said he moved to Chattanooga six years ago from Michigan to open Jet's Pizza in Rivermont Shopping Center. In Michigan, Neumaier said, Jet's is a familiar name and so when the opportunity came up for his own store, he took it. At Tropical Smoothie, he said, plans are to have a grand opening with a bunch of giveaways. Hours are to be Monday through Friday, 7 a.m. to 9 p.m. On Saturday, hours are 8 a.m. to 9 p.m. and Sunday, 9 a.m. to 8 p.m.